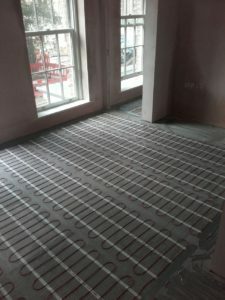 Appointed by our client to design, supply and install the underfloor heating, this project was a high-quality residential redevelopment of a neo-Georgian building located adjacent to Tobacco Dock in Wapping. With transport links to both the City and Canary Wharf the location is ideal for city workers. The existing building forms a quadrangle around a central courtyard, which has gone through a change of use from underused offices to 124 high quality apartments. Extensive refurbishment work was required as part of the change including structural alterations, floor infills and major reconfiguration of load bearing walls. Now under the brand of ‘Tobacco Dock’ the area is a sustainable, lively, mixed-use neighbourhood made up of leisure, residential, retail and commercial developments. Situated not far from the Tower of London, it’s no surprise that there is a royal them to the terrace names, King Charles, Queen Anne and Queen Victoria. The 124 fully refurbished, high quality apartments boast a 24-hour concierge set around a beautiful communal courtyard garden square, this development consists of 26 suites, 53 one bedroomed apartments and 45 two bedroomed apartments. Each apartment is finished to a high standard with wooden floors, the DEVImat under floor heating solution and contemporary bathrooms and kitchens. The DEVImat warm floor system consists of a self-adhesive mesh, with an ultra-thin heating cable pre-attached. On this project the system is controlled by the Heatmiser Neosat-e. The mats are simple and quick to install and only 3.5mm thick making it the right solution to fit directly on to an existing concrete floor. The DEVImat is installed within the thickness of the adhesives and therefore adds no significant height to the floor level. 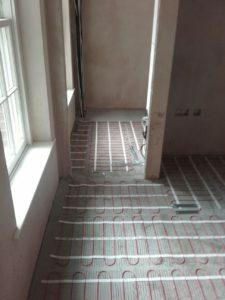 Consequently, there should be no need to reduce door heights or raise skirting boards, a benefit when changing the use of an existing building and installing underfloor heating. The Heatmiser neoStat-e offers a smarter way to control the electric underfloor heating from anywhere. With new menu navigation the neoStat-e has been designed for ease of use making programming much simpler. Senior Account Manager Joshua Demetrescu said of the project “The project went very well from initial design stage through to installation. 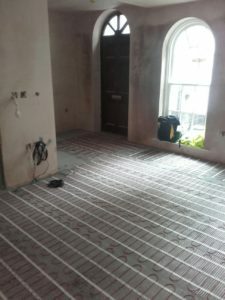 Electric underfloor heating is our bread and butter as we’ve been specialists in this system of underfloor heating for a number of years now”. To view more projects click here and to make an enquiry click here complete our contact form.